This will be the year that consumers seek to find balance in a world that is rapidly tilting out of control, according to a new study by global ethnographical market research firm Canvas8. “People are seeking equilibrium in all aspects of their lives – between humans and technology, brand and personal, global and local ,” Jo Allison, editor of the report, writes. Drawing on insights from 42 experts (including yours truly) ranging from specialties in shopping, health, technology, entertainment, money, careers and citizenship, its Expert Outlook 2019: Find Balance report takes a broad-based look at the trends that are shaping consumers lives in 2019 and brands that are in tune with the shifts. Here are highlights of the trends that will have most impact on consumers’ retail behavior with the experts highlighting brands that are on the forefront of the trends. Diversity and inclusivity are shaping the future in beauty where consumers of any gender, all sexual persuasions and every skin color are seeking to align with brands that understand their individual uniqueness. They will reject brands that force them into a predefined mold of beauty. She further sees beauty as a way for individuals to experiment with new ways to of self-expression. On the cutting edge of this trend is Chanel, which just introduced its men’s makeup line called Boy de Chanel. Technology will shape the face of beauty, as well. “The beauty industry is deep in its ‘Uber’ moment,” reflects Dr. Barbara Brockway, of Applied DNA Sciences. “Beyond consumers using smart mirrors such as the HiMirror and various other apps to judge the appearance of products, the internet of Things is connecting all gadgets, so new at-home beauty-Nespresso-type machines can make single doses of bespoke products, designed perfectly for someone’s days,” she continues. With experientially-minded millennials traveling more, they will look for beauty brands that understand his or her on-the-go beauty needs, like Yuni Beauty Flash Bath mousse that can be used without a standard shower or bath. “Many brands, including those within the luxury sector, are refining their deluxe travel-size options,” Jillian Wright, Indie Beauty Media Group, shares. Other brands on the cutting edge of these trends include Bare Me Beauty in skin care, Andmetics for hair waxing, Jade Beauty Roller’s tool for healthier skin, and Milk Makeup and Glossier for clean-faced beauty. Hardly a new trend, responsible consumerism will go mainstream in 2019. With the growing ease of buying goods, consumers will seek out brands that help them make better, more responsible choices, “whether that’s in stemming the tide of misinformation or cutting back on the vast amounts of waste headed to landfills,” Canvas8’s Allison writes. Taking the lead in responsible consumerism are Ikea which challenges its customers to become instigators of social change, Nike that is aligning with its customers’ social issues and environmental concerns, and For Days offering a membership model for temporary clothing ownership. He further challenges brands to do more than talk-the-talk, but to walk-the-walk in responsibility. “Lots of people are familiar with the idea of the circular economy now, but there’s still quite a gap between rhetoric and reality,” he believes. In food healthy eating comes to the forefront. “Consumers are more interested in food as preventative medicine because they realise their diet is a big component of their health so there’s an increase desire to know what they are eating,” shares Megan Poinski, senior Food Dive editor. She points to Impossible Foods that answers that need by offering plant-based “meat” products that deliver hearty satisfaction on the tongue and better health in the body. Healthy eating means abandoning factory-made food and buying closer to home. Community-sourced agriculture (CSA) is a trend we will hear more about in 2019, predicts Jenn de la Vega, cook-in-residence at Taste Cooking. Local Roots is a NYC-based company that delivers back-to-basic food in high-tech ways, allowing consumers to select produce from 20 farmers’ markets, subscribe and order online then pickup their farm-to-table orders at convenient locations. Another brand aligned with this trend is Oppo, according to Brandt Maybury, co-founder of Tastehead. It is a better-for-you “ice cream” indulgence with less calories, sugar and fat but all the taste of the real thing. The cocooning trend, so named by Faith Popcorn back in the 1980s, will take a 21st century twist as the uncertainties of contemporary life drive people back home into “comfort-first sanctuaries that can provide respite from an increasingly uncertain world,” predicts Canvas8’s Allison. Technology in the form of easy-to-install home security systems will offer a safe haven and more control in the home. “Smart home integration can now offer more than just protection thanks to app-based access to lights, thermostats, garage doors and locks,” says Peter Giacalone, president of Giacalone Associates. Amazon-owned Ring is a brand on the cusp of this trend. It is described as providing more than a home security system. It is a company whose mission is to reduce crime in neighborhoods through a “Ring of Security” provided by networked doorbell and spotlight cameras. Inside the home, safety in the form of healthier indoor environments is another trend. Sensitive lighting that enhances energy and sleep, indoor noise control and improved air quality are all on the agenda, according to Oliver Heath, biophilic design consultant at Heath Design. For the later, people will turn to nature. “We’re seeing more interest in using plants to create a sense of peace indoors,” he says, with companies like Patch and Plantabox making it easy for people to grow personal indoor gardens that will lead to healthier indoor environments. This will be the year the luxury industry meets the HENRYs (high-earners-not-rich-yet). They are the leading-edge of the millennial generation who will reach 38 years of age this year and hit their stride in terms of career and income. Behind them come the Gen Y’s, the oldest of whom will turn 22 years old and start their careers in great demand in a full-employment economy. The trendsetters in these two cohorts will be the most educated, most connected and those with the most money – HENRYs in the top 25 percentile in income. The young moneyed are in search of luxury brands that are aligned with their personal values and in tune with the digital way they prefer to engage with brands. The luxury watch sector is reeling from their advance, as brands like Patek Philippe fall flat being positioned as a watch you don’t own, but take care of for future generations. Next-gen HENRYs, “don’t necessarily have this long-term vision,” explains Dina Khalifa, of the British School of Fashion. “They’re buying for now, not for future investment, so a digital watch is much cooler. Young people are after products that integrate tech, as opposed to just seeking out old-fashioned craftsmanship,” Khalifa shares. This year luxury brands will be looking across industries to “cross-contaminate” in order to break out of old paradigms and discover new ones, believes Florine Eppe Beauloye, founder of mOOnshot digital. They will seek “collaborations and new offerings that magnify a brand’s DNA rather than distort it. Luxury brands increasingly have to reach outside their comfort zones to court youth, through everything from capsule collaborations to strategic creative talent appointments,” she shares. Burberry and Farfetch are brands that exemplify this trend in fashion and 1stdibs in luxury home furnishing. In 2019 luxury brands will face massive cultural shifts unlike any they have seen before. Young people increasingly distrust the elite and powerful and feel disdain for brands that force them to conform to an external model of luxury. “They’re looking for luxury that they can proudly define themselves by. It’s luxury on the inside, not the outside, that counts,” I shared in the report. “There’s now a large swathe of young people for whom the idea of wearing a logo or being a conspicuous consumer is anathema,” I say and luxury brands will be called on this year to actively embrace the new democratic and inclusive, no longer exclusive, spirit of luxury. The divergent paths of online and physical retail will meet in the middle in 2019. “Just as brick-and-mortar shops are scrambling to meet the demand for convenience, digital retailers are opening physical spaces too,” Canvas8’s Allison writes. Shoppers still want the benefits of touching, feeling and experiencing shopping in the real-world, even while digital appeals for its greater access and convenience. Phibbs sees Target on the forefront of combining exciting in-store experiences with digital convenience. Also embracing the phygital retail trend is Bloomingdale’s. It recently unveiled a new beauty floor at its 59th Street flagship that combines the latest high-tech features with high-touch personal service. Technology will not only enable more ways for people to shop along their preferred paths, but retailers will begin using AI to provide personnel on the shop floor with instant information to better serve and advise customers, believes Glynn Davis, founder of Retail Insider. Retailers will continue to push the envelop with click-and-collect options and home delivery convenience. “We could see everything from deliveries to retailers to add-on services like someone cooking meals for you from your grocery delivery being developed,” Davis predicts. Jemima Bird, ceo of Hello Finch, warns that innovative technology should never be used to replace in-store emotional interaction. “The power of experiential retail will become more crucial in 2019, as convenient ordering and delivery models disincentivize people from purpose-led shopping,” she says, and calls on retailers to shift from transactional thinking to a more encompassing customer relationship. 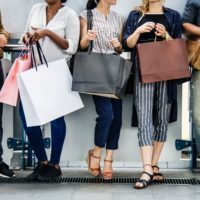 Retailers “would do well to appeal to the other reasons people buy things – because of an emotional connection or a need for entertainment – rather than simply wanting more possessions,” Bird advises. The overarching theme emerging in these trends is the need for brands to make it real in 2019. Retailers need a deep understanding of their customers, not just as consumers to extract more money from, but people with a diversity of needs that cuts across all aspects of their lives. Because pundits, me included, have overused the term “authenticity,” it is too often given short shrift. But in 2019 retailers will most of all need to be authentic, be real and be human, even as techno-powered consumers force them to turn increasingly digital . Retailers will need that human connection in order to keep growing and prospering in the evolving consumer landscape.